I love the 4th of July. When I was younger we use to have a family reunion up the path at my Grandparents house. It was always so much fun. Lots of good food and we saw cousins that we didn’t see all that often. I remember Grandpa Peters always bought small bottles of Seymour Pop. Then we would have sparklers and watch the fireworks that were shot off. This week I am going to post some fun and easy treats or things to do for your 4th of July. I hope everyone has nice weather and can spend the day outside! 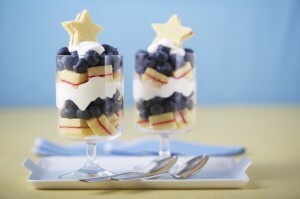 Today recipe is courtesy of Blueberry Council’s consumer website. You can find a ton of great recipes there. I hope you Enjoy it!